* That's why America can not move US embassy to Jerusalem. * That's why Olympic can not recognize Jerusalem as The Capital of Israel. * That's why the world demands to give Jerusalem to an Arab state. * UN 181(II) illegally ORDERS to terminate Jewish Mandate for Palestine. 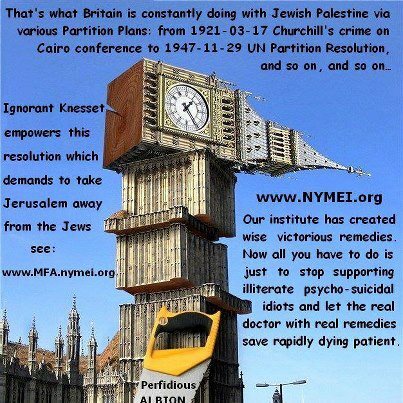 * According to the Mandatory Law (see http://facebook.com/note.php?note_id=500517039977314 and p.1 of http://SUMMARY.nymei.org/ ) Mandate for Palestine is Jewish, not British. So the Jews need to support Mandate, not illegal UN resolution 181(II). * Not UN but Knesset's support empowers and legalize that completely illegal UN 181(II). It is legalized by the power of Knesset over all Israeli people. * Because of that psycho-suicidal behavior of Knesset, US can not exercise Jerusalem Embassy Act - public law passed by Congress yet on 1995-10-23. * Only because of that Knesset's stupidity, UN 181(II) is still valid and actively used. * "Palestinian" membership in UNESCO was filed and recently approved based on that UN 181(II). * "Palestinian" state was created based on that UN 181(II). * "Palestinian" state was officially recognized by almost all the countries and nations of the world based on that UN 181(II).